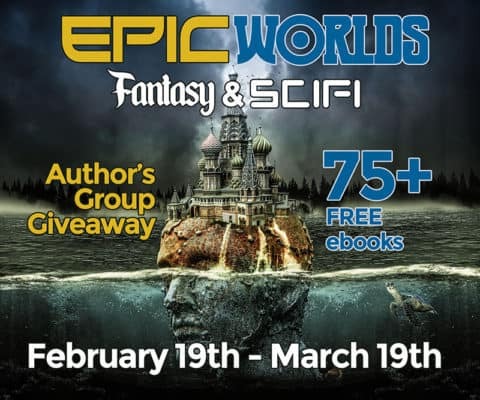 I’m joining together with more than 75 other science fiction, fantasy, and fantasy romance authors to do a huge EpicWorlds ebook giveaway starting today! There are all kinds of great selections listed in this giveaway, and they’re all FREE! With so many selections, it wouldn’t be hard to find enough books to keep you busy reading from now until spring. Some of the authors participating are Brandon Barr, Laura VanArendonk Baugh, Brian S. Ference, Ilana Waters, Lisa Blackwood, C. S. Wilde, and so many, many others. The giveaway will be going on from today through March 19th. You can check out the EpicWorlds giveaway page by tapping the image below. And remember, if you like the books you get for free, a really awesome thing to do is write a review on Amazon and Goodreads. Lots of people read reviews before deciding whether or not to buy a book, and even two or three sentences about what you liked or didn’t like can help someone make a decision. Additionally, while giveaways like EpicWorlds don’t have requirements for how many reviews a book has, some giveaways and promotions do have that sort of requirement, and your review could make the difference to an indie author. If you don’t have an e-reader, you can always read these books on your computer or tablet by selecting the PDF option to download. Android and iOS tablets also have apps that let you read .mobi and .epub files, the two types of ebook files, so don’t let that hold you back.